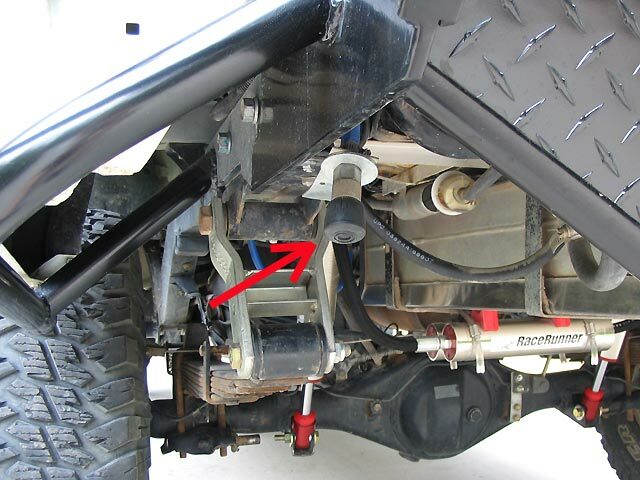 I have equipped my Tacoma with an on-board air system that serves two primary functions: To re-inflate tires after using them at reduced pressures for trail use, and to supply air pressure for an ARB air locker that is installed in the front differential. 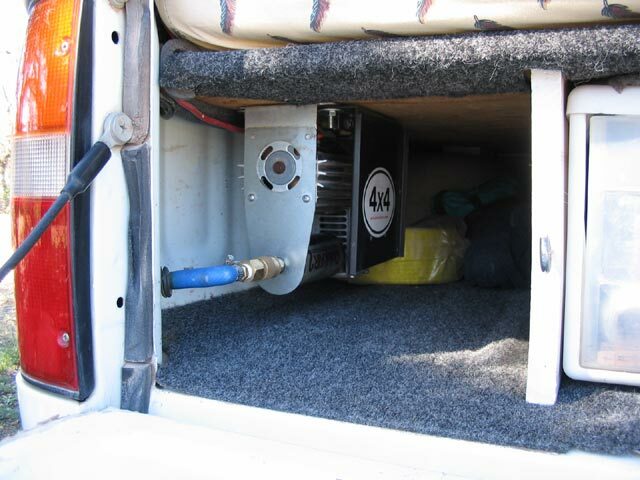 There are many different types of air systems to choose from, and I decided on a permanently mounted 12V compressor because it will continue to produce air during long trips and in remote locations where pressurized CO2 may not be available. When it comes to sheer filling power, a CO2 system (QuickAir CO2, Powertank, etc.) 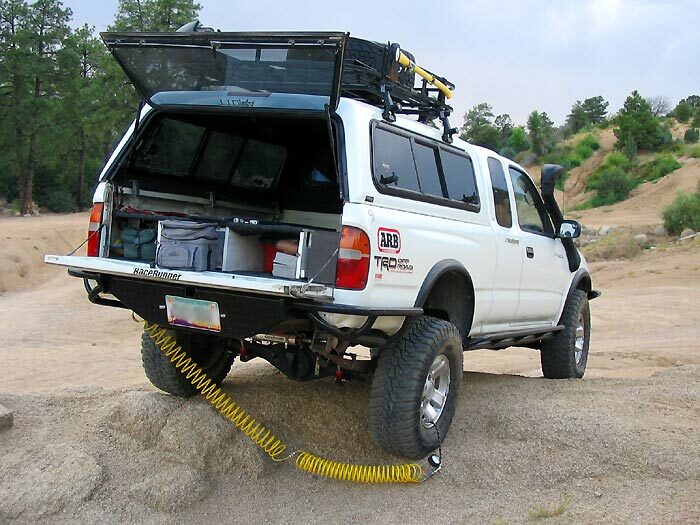 will by far out-perform any 12v air compressor that I know of, and they are so convenient for filling large tires and can even be used to run air tools and re-seat tire beads. The ultimate would be to have both systems (C02 and a compressor) for the convenience of the CO2 and free and reliable air that a compressor produces. Of course, having both systems on-board at once creates a redundancy when you consider the additional weight and space occupied. Remember, every ounce counts. For weight, reliability, and cost considerations, I am satisfied with a mid-range compressor. Durability and performance are key factors. The QuickAir II air compressor, made by Sun Performance, has proven to be a robust and durable piece of equipment that is "mid-range" in terms of price, performance, power consumption, bulk, and weight. When choosing a compressor that will serve double-duty for not only inflating tires, but operating an air locker, it is important to choose a model that not only has a high volume of air output (cfm), but one that will attain a high enough pressure to operate the locker. 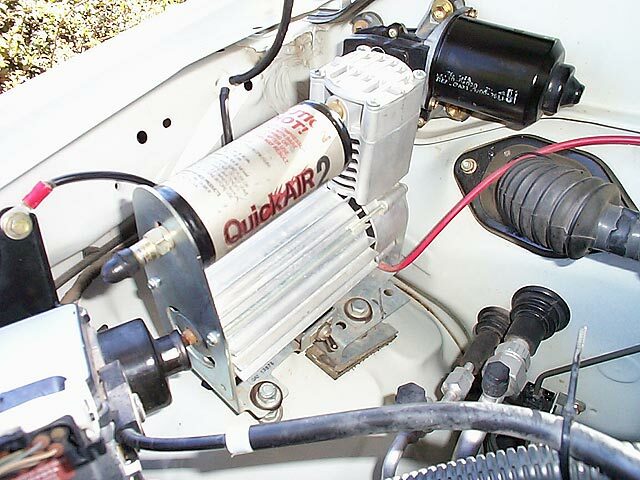 The QuickAir II specifications are as follows: At 0 psi, 2.18 CFM at 22 amp current draw. At 105 psi, .77 CFM at 28 amp current draw. Weight is 10 lbs. It takes about 2 1/2 minutes per tire, to pressurize my 32x11.5x15 tires from 17 psi to 34 psi. I originally had this compressor mounted in the engine bay, on the right fender well. This was a good location since it was fairly protected and out of the way. The downside was that I had to open the hood every time I wanted to use it (not a big deal really) and worse was the amount of heat. 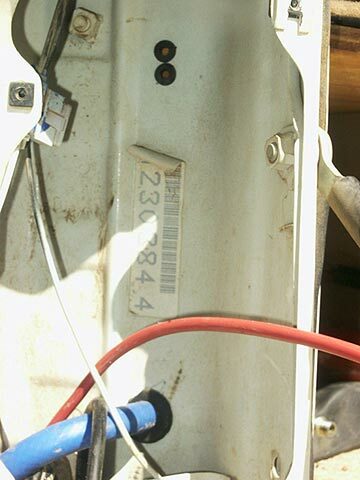 The engine bay was already a very hot location, and the heat generated by the compressor in addition, made for a very hot operating temperature. When I installed my dual battery system, the compressor lost it's place in the engine bay to make room for one of my batteries. I relocated it to the rear of the truck, where it would still be protected and out of the way. I mounted it upside down, fastening it to the cargo deck. I had a nice piece of black metal with a flange on it from my Xantrex Pathmaker battery controller (see my dual battery article) that I used as a "guard" to keep any items from the cargo bay from laying up against or rubbing on the compressor. This would also ensure good air circulation when other items are packed in this cargo bay. I drilled a hole in the sheetmetal behind the tail lamp, and installed a rubber grommet for the air hose to pass through. The hose is routed through the tail lamp housing, and down to the frame. From there, I installed a tee with a branch hose to supply a quick-disconnect fitting for my air hose. I made a simple bracket to position the hose in a convenient location to utilize the quick-disconnect. The QD is covered with a rubber cap that I found at the hardware store (used for the bottom of canes and maybe furniture).